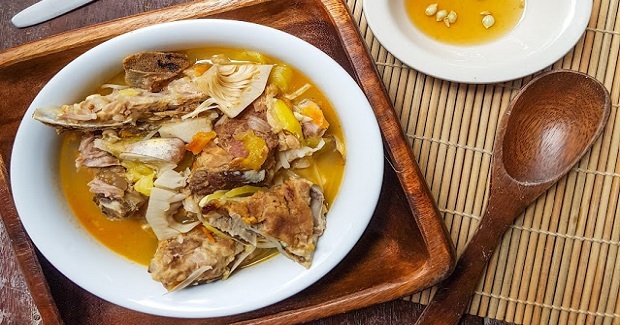 Pork Ribs And Young Jackfruit Soup Recipe - Gutom Na! Posted on Wednesday, October 12th, 2016 at 7:33 pm. 2 Tablespoons of annato seed soaked in 1/2 cup hot water (optional). Preheat oven to 240 degrees Celsius or to the highest mark. Clean pork ribs and pat dry. Season with salt and bake 25 minutes on each side or until golden brown. In a pot, combine garlic, onion, rice wash, tomatoes, bouillon cube and baked pork ribs. Boil and simmer for 30 minutes or until tender. Add the chopped young jackfruit. Add more water if needed and season with fish sauce and black pepper. Simmer for another 30 minutes. Add the annatto water gradually just to add a little color or you can totally ignore this step. Serve with fish sauce and calamansi and hot bowl of steamed rice. Add chili to the fish sauce mixture and you will surely eat a lot.